Showcase #4 The Flash (DC, 1956) CBCS Apparent VG- 3.5 Slight (A) Off-white to white pages. Considered by most to be the first Silver Age comic. Origin and first appearance of the Silver Age Flash (Barry Allen). First appearance of Iris West. Cover and art by Carmine Infantino and Joe Kubert. Currently sits at #4 on Overstreet's list of Top 50 Silver Age Comics. 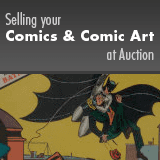 CBCS notes, "Amateur Restoration Includes: Moderate amount of color touch on cover." Overstreet 2017 GD 2.0 value = $6,000; VG 4.0 value = $12,000.